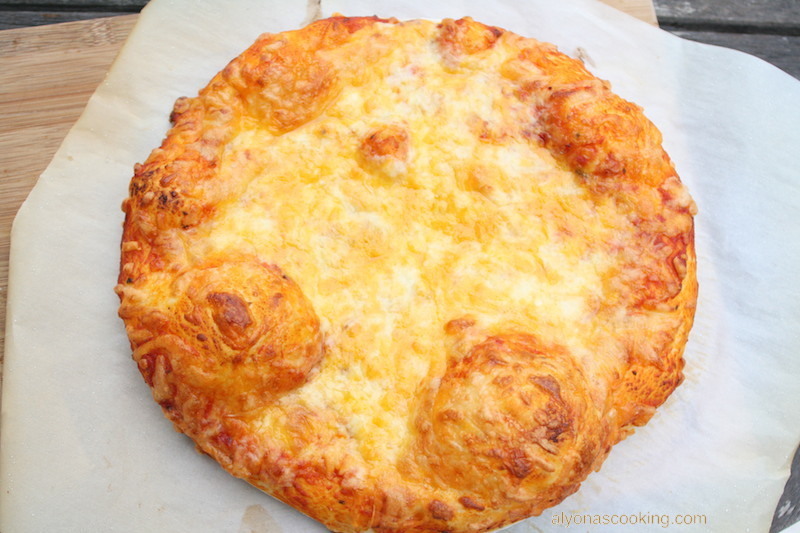 This Fluffy & Crusty Pizza Dough Recipe provides fluffy interior and crusty exterior and that is what makes me come back to this pizza dough recipe. I can’t remember a time this dough recipe didn’t turn out when making pizza. It’s super quick to prepare and bakes away to fluffiness! 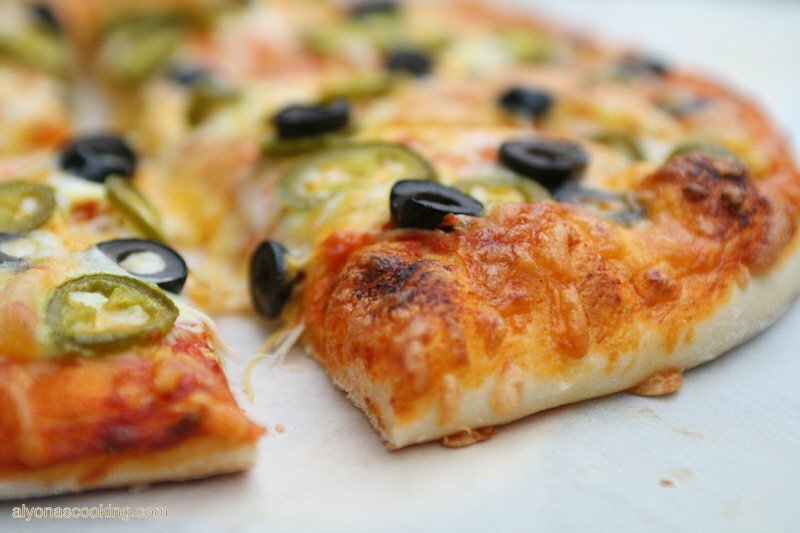 I have a lot of pizza dough recipes that I enjoy but this one is easy, fluffy and slightly crusty on the outside, which is what I like when making pizza. 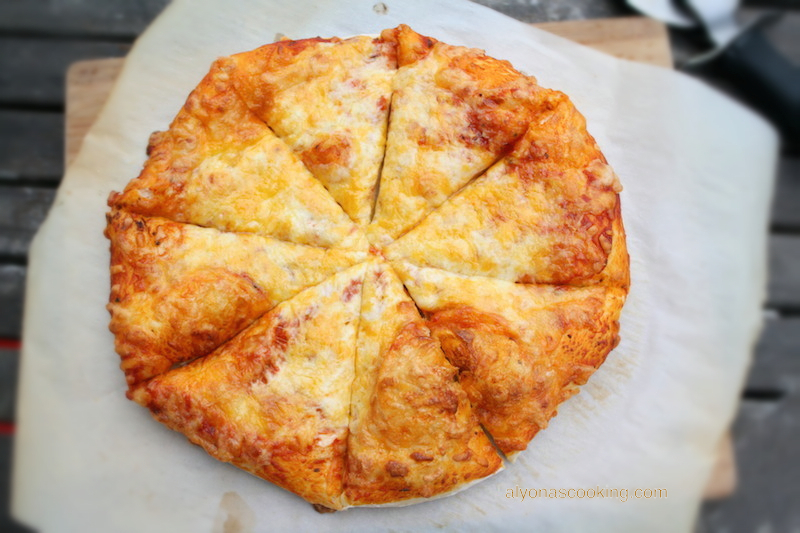 I’m assuming the baking powder contributes to the texture of the crust because when I make pizza dough without it, my pizza can get fluffy all around creating more of a bread like texture than a classic crusty and fluffy slice of pizza. I must say that a pizza stone helps to achieve that kind of crust as well. But the good news is you can create a pizza stone right at home. 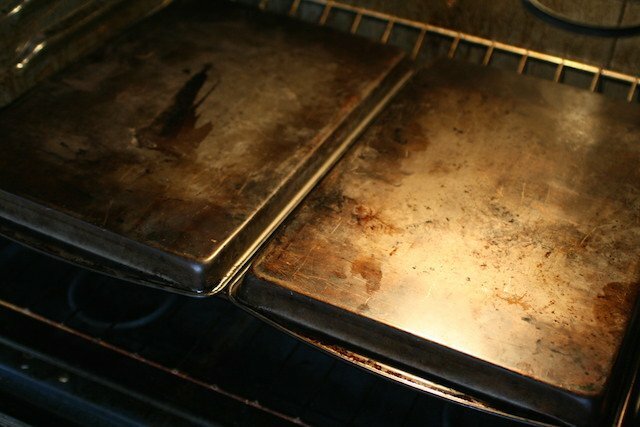 I used two old cookie sheets that I placed upside down on the lower half of my oven. I then preheat the oven with them in it, creating a hot surface for the prepared pizza. This baking technique creates a nicely browned crust. 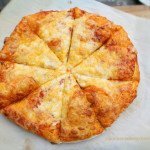 I hope this may become your staple pizza dough recipe as this Fluffy & Crusty Pizza Dough Recipe is my current go-to recipe for pizza. NOTE: You will not detect the parmesan cheese or the garlic powder in the pizza dough but feel free to omit. Place the dry ingredients into the bowl of the mixer; add the oil. Turn the mixer on low speed and slowly pour in the water/yeast mixture. Knead dough for 10 minutes. Cover and allow the dough to rise for 1 hour or until doubled. Roll the dough out; top with toppings and allow another hour or so to rise before baking. 2.) 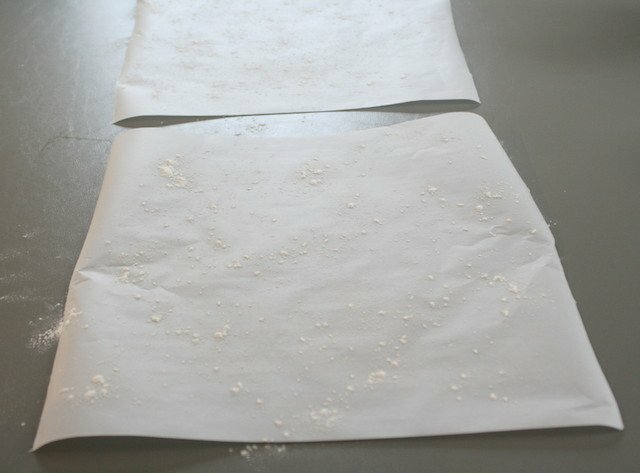 Cut out two (16″ wide) pieces of parchment paper. Place on a flat surface; dust with flour and set aside. 3.) 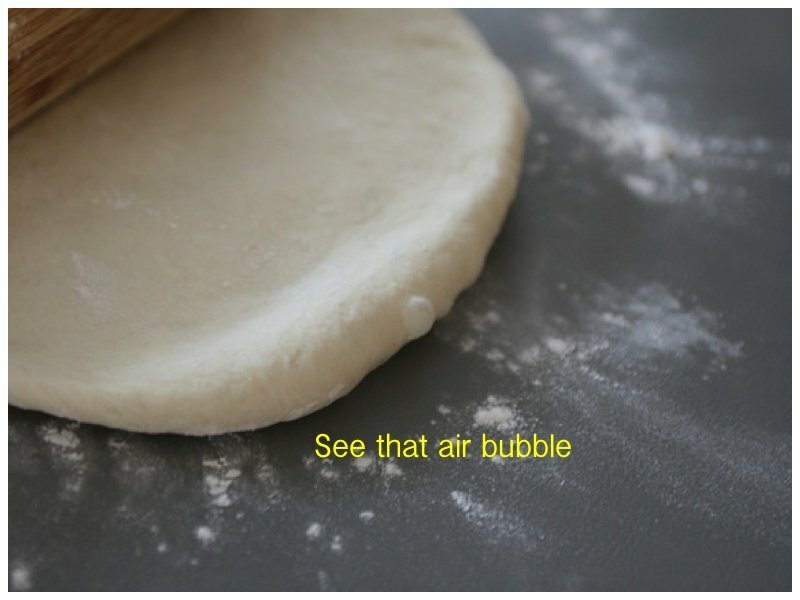 Once the dough cycle has finished (or when the dough has finished rising after kneading) transfer dough onto a floured surface. 4.) Cut the dough into two equal pieces and flip over. Take the ends of each piece and pinch together to form a ball. 5.) 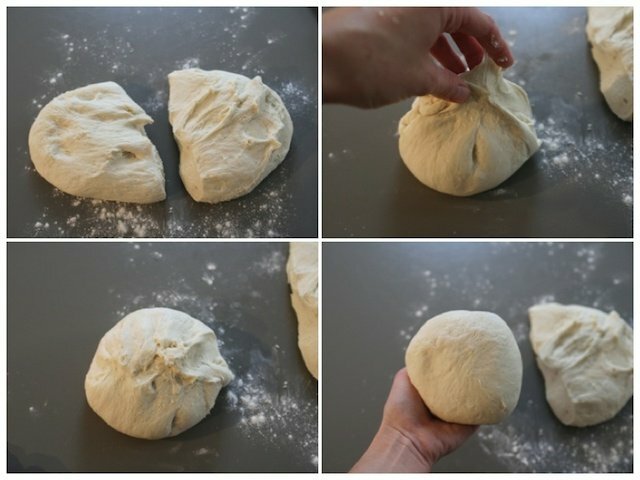 Roll the dough out into an 11″-12″ circle. Transfer onto parchment paper; top with desired toppings and allow prepared pizzas to rise for 45 min. 7.) 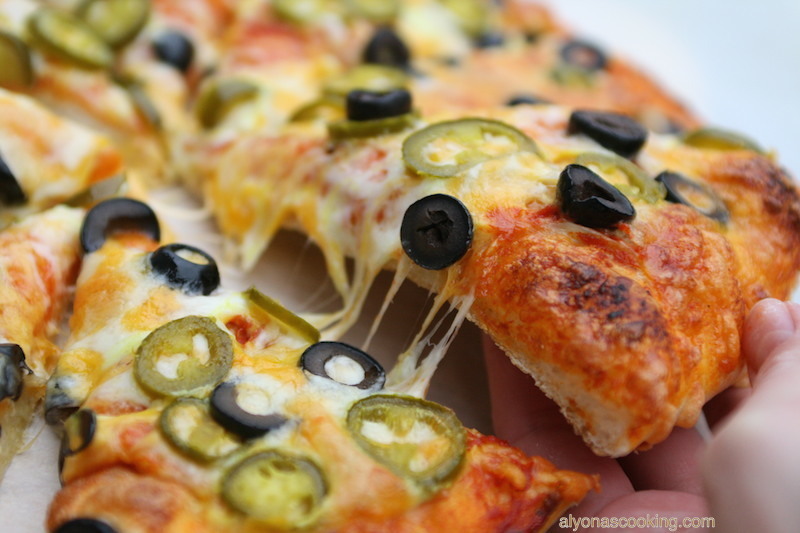 Slide the parchment paper with the pizza on top onto a large tray or cutting board. Then carefully slide the parchment paper onto the preheated hot baking sheets and bake one pizza at a time for 14-16 minutes. 8.) 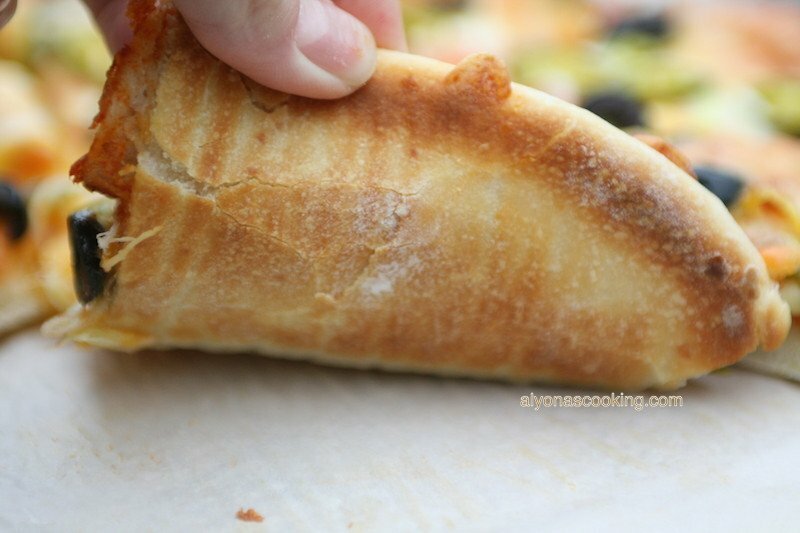 Remove the pizza by dragging the parchment paper onto a cutting board and slice. 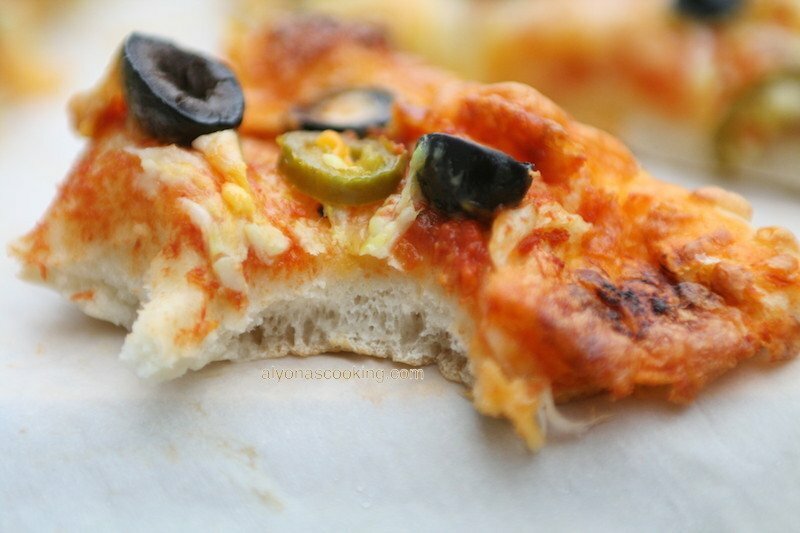 This Fluffy & Crusty Pizza Dough Recipe provides fluffy interior and crusty exterior and that is what makes me come back to this pizza dough recipe. I can't remember a time this dough recipe didn't turn out when making pizza. It's super quick to prepare and bakes away to fluffiness! DIRECTIONS FOR STAND MIXER: Dissolve the yeast in warm water and set aside. Place the dry ingredients into the bowl of the mixer; add the oil. Turn the mixer on low speed and slowly pour in the water/yeast mixture. Knead dough for 10 minutes. Cover and allow the dough to rise for 1 hour or until doubled. Roll the dough out; top with toppings and allow another hour or so to rise before baking. Cut out two (16" wide) pieces of parchment paper. Place on a flat surface; dust with flour and set aside. 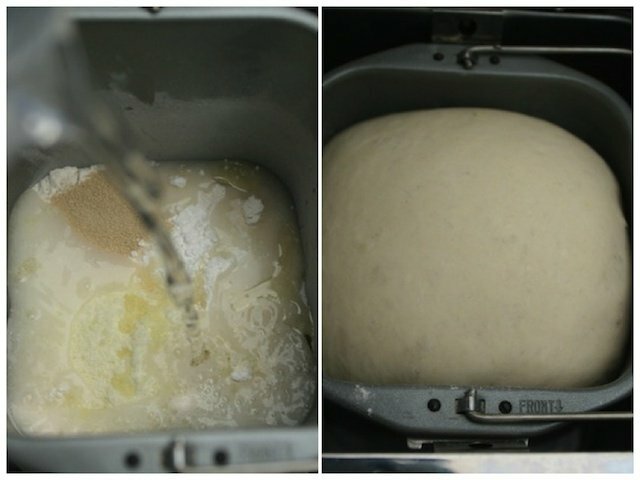 Once the dough cycle has finished (or when the dough has finished rising after kneading) transfer dough onto a floured surface. Cut the dough into two equal pieces and flip over. Take the ends of each piece and pinch together to form a ball. 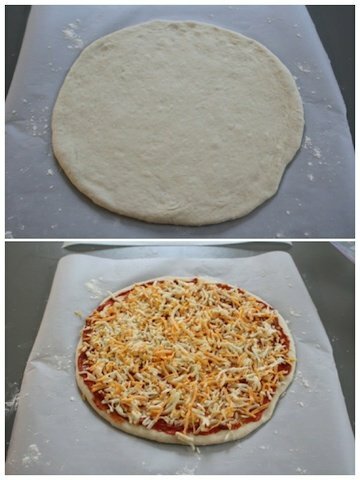 Roll the dough out into an 11"-12" circle. Transfer onto parchment paper; top with desired toppings and allow prepared pizzas to rise for 45 min. 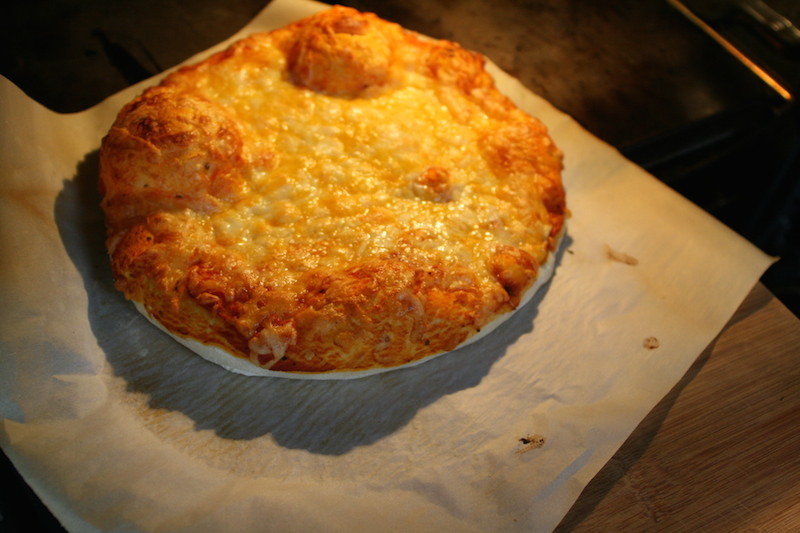 Slide the parchment paper with the pizza on top onto a large tray or cutting board. Then carefully slide the parchment paper onto the hot baking sheets and bake one pizza at a time for 14-16 minutes. 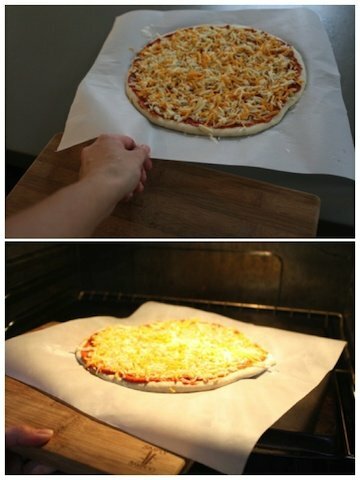 Remove the pizza by dragging the parchment paper onto a cutting board and slice. This is the recipe i am looking for.. thank you ??? My dough has turned out very liquidy. What can the issue be? Sounds like there must have been to much liquid added to the flour, did you use the right proportions as listed? Also did you try to fully incorporate the liquid into the flour? 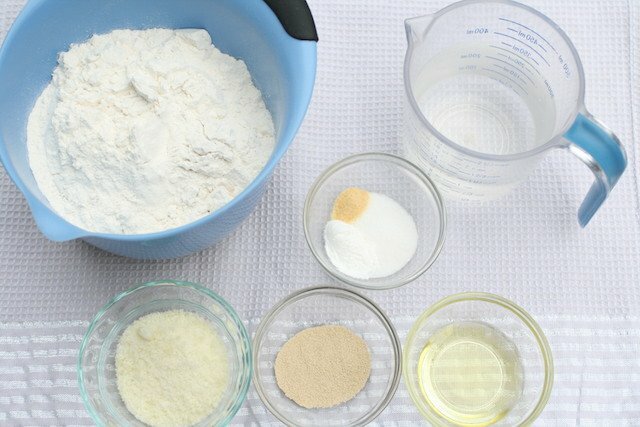 Gradually add more flour and knead by hand until the dough comes together to fix that problem. can i put this in the fridge at step 5 or (best) step 6 just before adding toppings ? it would be cool if that frozen dough could still raise after warming up for an hour. OMG! That turned out super good! Thanks a lot hubby s favorite crust so far.